July is Member Appreciation month here at the DIY Marketing Center, so this is the time that I tell you how much I appreciate working with you. Thank you! I SO appreciate you! Thank you for your membership at the DIY Marketing Center. I'm am grateful that you're finding the support, information, tools and community here worth keeping. As a token of my appreciation, the annual Member Appreciation special deal is turned up a notch: TRIPLE Rewards stickers for any/all purchases in July--how cool is that? All month long, you will receive three times the number of Rewards stickers, just because I appreciate you. You don't have to do anything to get them, because I will send them out to you with each and every qualifying purchase in July. That includes all 1:1 coaching sessions. All programs like 2017 Inspiration Weekend. And yes, all the upcoming fall programs, too, because registration will be open for pretty much everything through the end of the year by July 1. Yeah, baby! Also, just so you know: The DIY Appreciation Crusade, which includes surprise random give-aways on the DIY Facebook group page, is coming back on July 11. There are a bunch of cool prizes, and new ways to win. See your July newsletter for details. 2. TRIPLE rewards all month! 3. The 2016 DIY Appreciation Crusade on Facebook starts on July 11th and runs through July 22nd. It's going to be a great month for marketing AND appreciation here at the DIY--all for YOU, baby! Get Marketing Coaching on Tuesday! 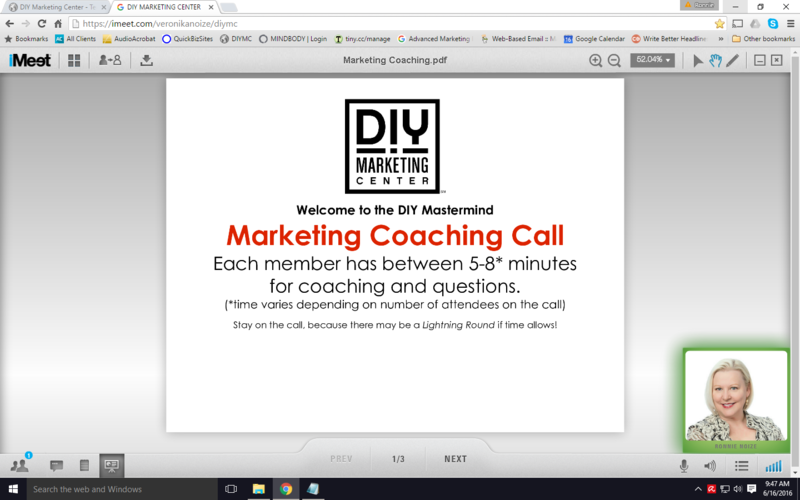 Mastermind Premium members are welcome to join the Marketing Coaching call on Tuesday at 10am. No need to register--just show up with your questions, challenges or status report. Don't have a specific issue to discuss or report? You'll get plenty of ideas, support, and motivation just from listening to what the other members are doing, so do plan to join the meeting if at all possible. However, if you are feeling stuck, need some direction, or just want to hear the voice of encouragement, this is your chance! You will find inspiration, motivation or whatever it takes to get the boost you need to get fired up this week. Get the Marketing Coaching Premium member password to access the meeting here.